I'm not sure where this will fit & I can't find the solution either. Is there a dark or night mode view for this forum? That light green and white are just too bright for my room. I know I can have firefox extension that toggles the light but prefer to have native control within the forum itself. There's no such option at the moment, sorry. It would require adding or creating a new style (theme) for the board. I gathered some input on this 2 years ago but it didn't reach a conclusion or draw wide interest: viewtopic.php?f=60&t=234487. 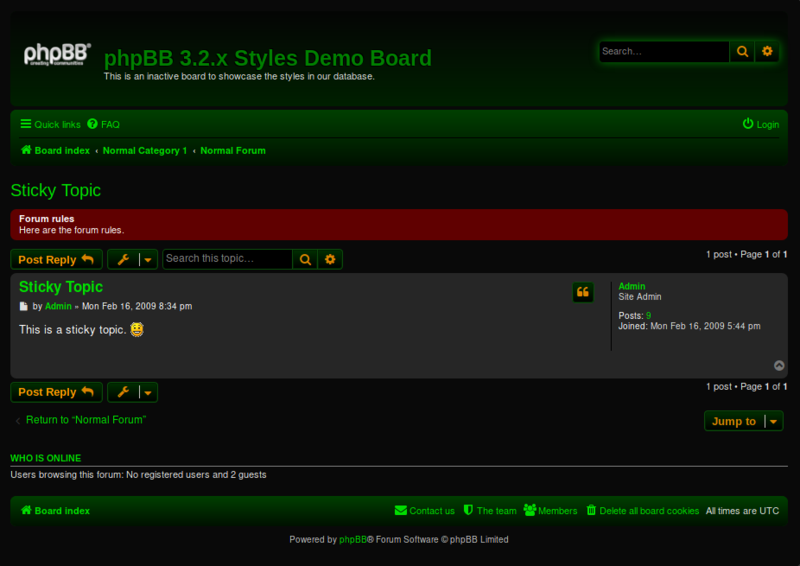 For our own style I know how to keep it up to date with phpBB releases but community created styles can lag (far) behind phpBB releases and that risks breaking them when I upgrade the board. I've been hesitant to add any styles I'm not comfortable maintaining myself for that reason. I'm not an artist so perhaps there could be some consensus on what makes a good dark style for people with vision impairment and perhaps somebody could step up to convert our style to use those colors, not changing anything else in the style. That way I could maintain it alongside our current style. Or a community created style could be selected, with the understanding that it can break at any moment. If there's anything in there that would work I could do a new topic on this with a poll. Realistically I think a browser extension is the way to go though. None of the above look very "minty". in the "stores" for chromium based browsers such as chromium, brave, slimjet, or google chrome browsers, there is an extension called "Night Mode Pro"...you can manually toggle back and forth between day and night...also you can use the gradient control to allow just the amount of brightness you need...i set mine at 75%...just make sure in the "options" setting that you untick the notification box as it is bothersome everytime it updates itself...in that options setting, there are the first seven boxes to either tick or untick...i have the first three ticked...the forth one which is the "notifications is unticked...then the next three are ticked and i leave it at that...it works perfectly. I found something similar in the add-ons for Waterfox, possibly also for Firefox: Dark Night Mode. Here's a screenshot taken while using it. I really like the ne-darkgreen (link in xenopeeks reply). Sort of reminds me of dark chocolate mint . .
Sure But I wonder if green text on black background and white text on grey background improves legibility for vision impaired users. But I wonder if green text on black background and white text on grey background improves legibility for vision impaired users. Pretty sure night mode in general is what you choose to become vision impaired, not when you already are. There are some system-wide options for night mode or day mode like "redshift" which may already be installed that you might consider as well. In Firefox I use night light add-on. It puts a small icon in the menu area and just a clk and it toggles between day and night mode. brilliant idea, thanks for starting topic skylinestar! my thoughts, +1 and yes! for adding this option to forum. @Moem, I like that darknightmode! but see that is only for chrome. They mention in faqs it can be modified to work in firefox "but it is complicated", lol, at least their honest about that You mentioned waterfox, do you have link to where/how you got this extension for waterfox? edit to add: It seems thier website faqs need to be updated, a quick search in firefox addons answered my question, very cool and thanks for the tip! AcidTech- nice blue on black contrast, I like! ne-blackgreen- I'm with richyrich on this one! dark chocolate mint (florescent even! :), great orange highlights this would be my daily driver. pycode- another decent grey, although unlike Carbon, the white text is muted and harder to see clearly with the grey background. For FF I like the 'Dark Reader' Extension. I have tried others but this works best for me. Seems you're lucky to not have any problems with your eyesight. I find dark modes very helpful when you have vision problems. I have an overall dark theme for my desktop (vertex-dark), use stylus on Firefox with Midnight-Surfing Alternative theme. Interesting. Personally I find black on white much more relaxing to read than the inverse, but I guess everybody's eyes are different. The exception for me is writing code, for that I prefer a dark background, but I think that's mostly because the syntax colouring is better that way.